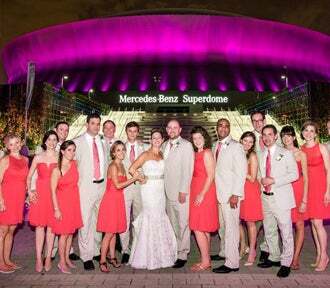 Centerplate is the exclusive caterer of the Mercedes-Benz Superdome, and the special events at the complex have been so successful because of the unique approach that is taken – your approach. Centerplate understands that private gatherings, large and small, require a personal touch, and the reflection of your taste is in every detail. Centerplate offers a superb selection of creative, New Orleans-inspired menu choices, and there is the option of designing a custom-tailored menu to fit the unique needs of a special event. Centerplate puts your needs first, whether you are hosting a celebration, corporate event, fundraiser or personal gathering. Born in Hartford, Connecticut, Executive Chef Lenny Martinsen earned degrees in Culinary Arts at Johnson & Wales University (Providence, Rhode Island) and in Hotel and Restaurant Management at Florida International University (Miami, Florida). In his over 30 years in the industry, Lenny has been actively involved in all aspects of Culinary/Food and Beverage operations including, but not limited to, restaurant design; menu and product development; and sales, marketing, and public relations. Chef Lenny joined the Centerplate team in 2007 as the Executive Chef of the Mercedes-Benz Superdome and the Smoothie King Center. Click below to view the Centerplate Catering Menu or contact Justin Roux, Director of Suites and Catering, to discuss customized menu options.